This medication works best when the amount of drug in your body is kept at a constant level. Therefore, take this drug at evenly spaced intervals. To help you remember, take it at the same time(s) each day. What conditions does Kaletra treat? Tell your doctor right away if you have any serious side effects, including: increased thirst, increased urination, confusion, persistent nausea/vomiting, stomach/abdominal pain, yellowing eyes/skin, dark urine. Get medical help right away if you have any very serious side effects, including: symptoms of a heart attack (such as chest/jaw/left arm pain, shortness of breath, unusual sweating), severe dizziness, fainting, slow/fast/irregular heartbeat. List Kaletra side effects by likelihood and severity. Before using this medication, tell your doctor or pharmacist your medical history, especially of: liver disease, diabetes, pancreatitis, high blood fat levels (cholesterol/triglycerides), heart problems (coronary artery disease, heart attack), bleeding problems (such as hemophilia), previous infection with certain diseases (such as hepatitis B infection, hepatitis C infection, tuberculosis). The risk of QT prolongation may be increased if you have certain medical conditions or are taking other drugs that may cause QT prolongation. Before using lopinavir/ritonavir, tell your doctor or pharmacist of all the drugs you take and if you have any of the following conditions: certain heart problems (heart failure, slow heartbeat, QT prolongation in the EKG), family history of certain heart problems (QT prolongation in the EKG, sudden cardiac death). What should I know regarding pregnancy, nursing and administering Kaletra to children or the elderly? Lopinavir/ritonavir interacts with many medications. Some products that may interact with this drug include: cobicistat, certain HIV medications (such as fosamprenavir, tipranavir), orlistat. Does Kaletra interact with other medications? 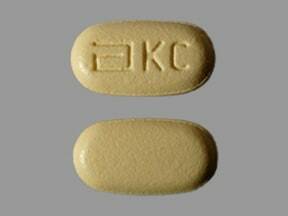 This medicine is a pale yellow, oval, film-coated, tablet imprinted with "logo KC". 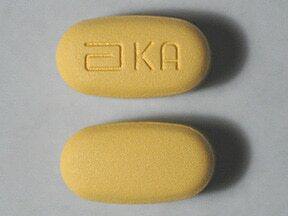 This medicine is a yellow, oval, film-coated, tablet imprinted with "logo and KA". Are you considering switching to Kaletra? How long have you been taking Kaletra?